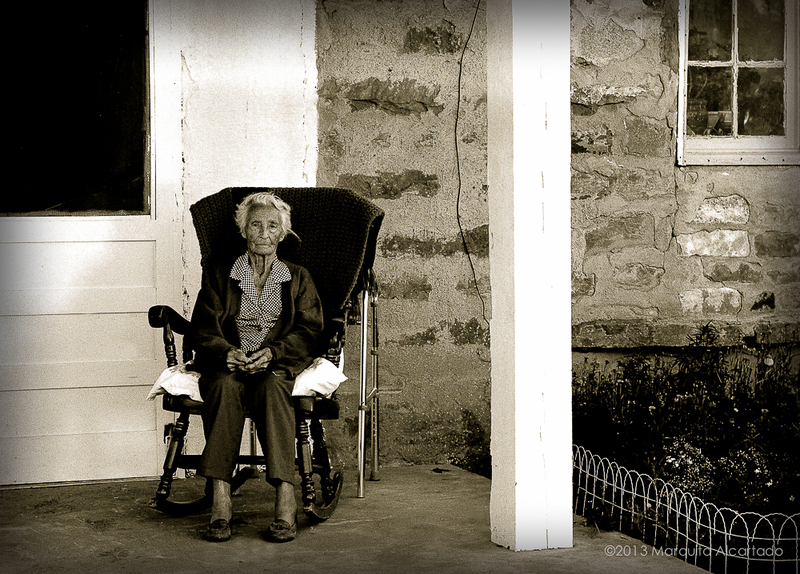 This portrait, captured in June of 1992, was the last portrait I took of Grandma at home. She sat in her rocker on her front step, facing west, looking so much more fragile than she did when I arrived, four weeks previous. I faced her and waited for her to compose herself. In a few short minutes I would be on my way back to California, leaving my mother and uncle to figure out how to care for her now that her unshakeable independence had been broken. Grandma is at the exact center of almost every memory I have of Peacock Canyon. The rock dwelling in the background is her home and was built, in the 40’s, when my grandparents purchased the land originally. They built the house, one room at a time, from the abundant source of sandstone on the land. The first room was about ten feet square. The home as it is, in this image, has four main rooms with a bathroom (the original space) that my Grandfather, a master plumber, built to last. A small living and dining room area connects to the bathroom. This room has a big picture window facing the southern mesa, its main focal point. An aluminum white and blue enameled table, from the 50’s, is the dominant fixture in this room with a daybed on the east wall and a cast iron wood stove in the shape of a barrel against the rock wall on the north side of the room which provided our heat in the winter. Grandma’s rocker sits next to the stove, facing the window. There is a kitchen adjacent to this room on the south side with an exterior door out the “back” of the house and an inside door that passes from the kitchen to the one large bedroom on the northwest corner of the house. So if one were to exit the bathroom and travel in a clockwise direction they would take two steps south into the dining room, five or six steps west thru the kitchen, two steps north into the bedroom and another three steps east to Grandma’s bed–it is that small. Imagine, my mother and grandmother, living with four children here in the early 70’s. The kitchen was where Grandma practiced her favorite art form and where she taught me to bake. She loved brownies and cakes and other sweet things and I loved to make them. If there was any music playing this is the room where she would most likely grab you to dance with her, waltzing between the sink and the knife drawer with a joyous breathless lilt to her steps, laughing girlishly. On the exterior of the little rock house is a patchwork of plaster. I’ve always wondered if they ran out or if they just liked the ruggedness of the sandstone rock work. Either way, the image shows it as it was and as it had always been in my memories. The image of every wall, north, south. east and west, hit me while I photographed Grandma that morning. She is at the center of the rock, like the intrusive copper ore vein that runs through the bluffs encircling her home in the canyon walls of sedimentary rock. After I positioned the tripod and camera that morning, Uncle Pete, placed her new walker behind her chair and cleared himself from the lens perspective. He stands there as a tall, strong and encouraging presence out of frame. In every image I have made of Grandma, with any deliberation, she always looked intently into the camera and smiled a little half-smile. That’s what she is doing here–her Dry Cimarron Mona Lisa expression. Not twenty feet around the corner from her rocker heading south, is the place I found her on the ground, six feet from the kitchen door and a few feet from her enormous lilac bush–three weeks prior to this moment. She was screaming from the pain of her fall. I immediately suspected the fall was precipitated by her enormous dog, Tippy, her loyal half-wolf companion, who was always under her feet, especially at meal time–the dog dish right there next to her. She tried to get up and I tried to calm her down. I was cursing myself for allowing her to be out of my sight. I had been napping when I heard the fall and her screams. Her voice was high, shrill and panicked. “I think I’ve broken my pelvis and my collarbone”, she stated and for the first time she stopped reacting to what must have been horrific pain. To myself, I silently did the calculations in my head about who I should call, how far away they lived from her and if they would have the resources for helping me get her safely and comfortably to the nearest hospital, 65 miles away in the Oklahoma Panhandle. Raton, NM was too far away and Clayton, NM was not an option either. The ranch at the time had no neighbors less than 12 miles away and none of them would be in a position to give medical attention or own a vehicle that could transport her carefully. I briefly considered making a bed for her in the dirt with some blankets but that seemed so wrong for Grandma who had a meticulous relationship with her bedding. She was crying and holding on to me, halfway sitting up. She couldn’t weigh more than ninety pounds, I thought. There was so much less of her physically, than who she was when I was a child. She was becoming miniaturized in her old age. My instincts were forming a plan before I could really stop to consider the consequences. I propped open the kitchen door, stepped off the wide rock step and, knelt down, placing my hands on her waist. “Okay, Tooks, I trust ‘ya”, she said with a soft desperate voice. We were both weeping. Her from the pain and me from the difficulty of seeing her like this–all broken up. I lifted her up, keeping her vertical and with her feet off the ground. She was as light as a three-year old child in those moments. Somehow I lifted her high enough to clear that high step and into the house thru the kitchen door. I moved as smoothly as I could, shuffle-sliding across the linoleum as though we were in an exaggerated two-step. I shuffled her into the dining and living room area and gently lowered her against the pillows of the daybed, and lifted her legs onto the bed. She was definitely in shock by now, cold to the touch, tears rolling down her cheeks, her muscles tense. I removed the pillows so that she was more flat and covered her with a blanket, wiping her face, hands and arms off with a clean washcloth. We both knew that this was the beginning of a long wait. I called the Cimarron Hospital in Boise City, OK and told them that we needed an ambulance. We waited for the ambulance for three hours. The two paramedics were volunteers from the local farming community. They were professional and compassionate to Grandma, who was not in the best of moods. I sat on a narrow bench in the back with her and held her hand for the duration of the ride. It was a brutal bumpy ride for an 88-year old woman, lying on a stretcher, with a broken pelvis and collarbone. Six hours following her accidental fall, she finally received medical attention. My mother, who traveled from her home in Clarendon, TX, arrived shortly thereafter and my uncle arrived sometime the next day. Between the three of us, someone was always with Grandma over the next few weeks. We stayed in a local motel. I expected that when the time came for me to return to California, I would be saying goodbye to Grandma in her hospital bed. I underestimated Grandma’s determination to return home. I was saying my goodbye from behind the camera in this moment–in the same way I had always done. Always, without exception, my goodbye is precipitated with a picture. A latent image to take home with me, to develop later, a gift to anticipate opening over the intervening miles away from my beloved childhood home, to my life in Sacramento. I placed my tripod about twelve feet in front of her and captured a few images in a few seconds. She commented on the welcome warmth of her chair and how happy she was to be home. Her voice was soft. She wanted me to stay longer. I made my rounds of hugging and holding with my family. Grandma and I sat on the daybed together, holding hands. In my long glance back in the rear view mirror, I see my Mom and Uncle, standing there waving from the front gate. Unlike so many other times, Grandma is absent, no final wave from the front gate as she leans on her broom, watching me, watching her. I can imagine her in her rocker now, housebound, for the time being, gazing out her picture window at the mesa and sky. She was a keen observer, in spite of her declining eyesight, she knew every hill, every cap rock and outcropping in that picture window. She knew the New Mexico sky in all its shades of turquoise, she knew the clouds and what they would or would not bring in the way of abundance. She watched the mare’s tail clouds–those futile wisps of vapor becoming more transparent in the heat of the day. In the distance she listens for the voices of three girls, my sisters and I, riding our ponies home from our latest adventure, full of our stories of other pastures, reports on the cattle and water gaps needing repair–hungry for whatever she’s been preparing as a meal. “There will be no rain today.” she announced to Tippy, patting his head before dozing off on her daybed. Posted in Essays, Loss, PhotographyTagged black and white, Essays, homesick, new mexico, Photography, ranching, relationshipsBookmark the permalink. Thank you for your kind words. I am enjoying your memoirs and other writing on Cold. Keep up the good work!